A Stuart Rose speech set the arguments about Europe back into the headlines on Monday. Such arguments over Britain's position in the European Union are set to get louder and louder in the weeks and months to come. That's because the referendum over our continued membership of the EU is getting closer. And the respective In and Out campaigns are being launched. In truth, no-one knows just yet when the referendum on our continued membership will actually occur. A Parliamentary Bill, preceding an Act of Parliament, that would make the referendum happen, is creeping its way through Parliament just now. Slow progress. But if anyone has any concern about the schedule then they are not letting on. In fact, it's precisely the opposite. The campaigns have started. All of them. 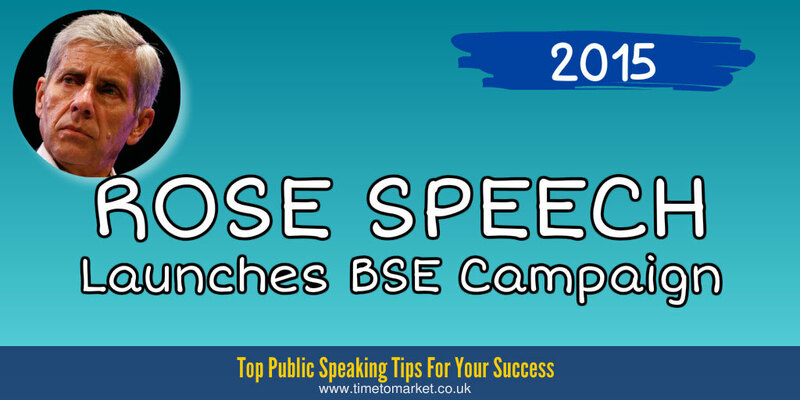 The latest campaign launch was the Britain Stronger in Europe campaign, or BSE. That's an unfortunate abbreviation for this particular effort. Britain's BSE crisis didn't exactly emphasise European solidarity. Far from it. Lord Rose's speech at the former Truman's brewery in East London wasn't the best of starts for the Stronger in Britain campaign. Most notably there was a clear disconnect between the text of the Rose speech given to journalists before the event and the speech that he actually gave. Journalists noted that the given speech failed to pick a fight with the Exit Campaign by dropping their label as "Quitters"! Now that could have been good manners on his part, for which we might be thankful. Or, he just might have missed that piece out by turning over a page of his script too far. Still, we were surprised that campaign director Will Straw made the mistake of briefing journalists with the script. Clearly not a chip off the old block. Lord Rose's speech wasn't the most invigorating of speeches. Far from it. It was a corporate set-piece given in a relatively flat tone. No questions. That's probably a portent for the campaign as a whole. In essence his speech looked at the fears, uncertainties and doubts with leaving the European Union. That approach worked with the Scotland referendum of 2014. Will it work with the EU referendum? His speech positively brimmed with facts, figures and statistics. Doubtless other campaigners will pull apart their veracity. But there was one statistic we really couldn't believe! Being in Britain saves every person around £480 million a year. Surely not! Lord Rose failed to notice his mistake and kept going with his speech. Quite right. Keep going when you make such an obvious clanger. Watch this space as these events and their respective speeches become more numerous and probably nastier. 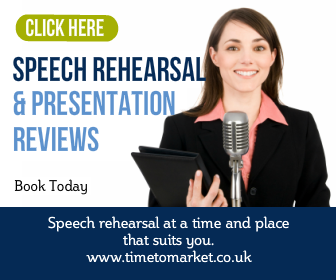 You can join a public speaking course run by Time to Market at any one of more than 40 training centres in the UK. Or, perhaps a corporate training day might suit your team. 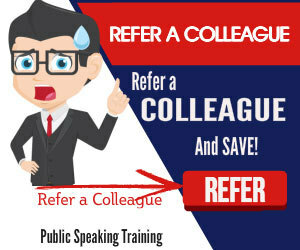 You can choose a corporate training session at your offices or a suitable off-site location. So, when the time is right, please don't hesitate to get in touch.